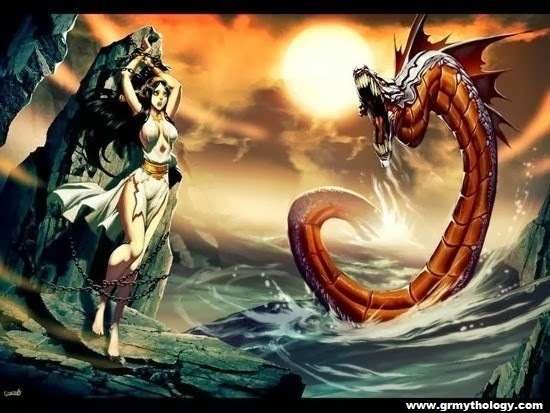 Andromeda | Learn about Greek Mythology,Greek gods,Greek mythology stories! With the bag draped on his shoulder, Perseus took the way home, flying over the sea to the southern regions. At some point, looking down he saw a beautiful girl chained to rocks. Being curious immediately dove as a bird and landed near her. "Who are you and what are you doing here?" he asked. "My name is Andromeda," answered the girl and immediately burst into tears. "My mother, the queen, boasted that she is even more beautiful by the Nereids, the Nymphs of the sea. But when the Nereids learned about that, were not happy at all. So they, complained, to the god of the sea, Poseidon, and he angered so much that he sent a flood and destroyed the country of my father. The only way to stop the evil, is my father to sacrifice me to a sea monster, which can be revealed at any moment". Perseus, looked Andromeda dazzled by her beauty and then he glanced the sea beneath his feet. There in the waves he picked out a monster which looked like a serpent, with enormous eyes and mouth wide open. Perseus was raised in the air, approached flying the monster and hit it with his sword. The monster swooped to grab Perseus with its claws, but he avoid it and prepared for a new attack. This time, the blow was fatal. The monster fell in the sea with horrible pains. Perseus gave it a final strike and killed it, and it was lost forever in the waves. Then Perseus flew again near Andromeda, broke the chains that had tied down and freed her. Then he escorted her to the palace of her father, king Cepheus. The king rejoiced so much that his daughter escaped from the monster and turned back safe, that he gave a great feast in honor of Perseus. He also promised to give Andromeda as his wife . Then the two young returned to Serifos and Perseus took Andromeda to meet his mother. She was so happy that her son came back hale and strong, but looked to be sad. "What is wrong?" Perseus asked her. "When you were away, Polydectes forced me to agree to marry him. Tomorrow is the wedding," she replied. Perseus outraged,ran into the palace to meet the king. Polydekctes was surprised because he did not expect that Perseus would return. "Here!I brought you the head of Medusa," said Perseus and carefully took the head out of the bag, and held it before the king. Immediately Polydectes and his friends were transformed into stone statues. Then, Perseus gave the throne to the king's brother, who ruled the island wisely. Finally, he returned the helmet, the winged sandals, the sword and the bag, back to the gods, after having thanked them for their useful gifts. Once everything had finished, he married Andromeda and they lived happily for many, many years.